Masaccio (Italian painter, 401-428), "St. Paul," 1426, Tempera on wood, 51 x 30 cm, Museo Nazionale, Pisa. Larger image. 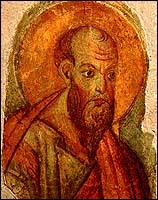 Pictures of St. Paul the Apostle are found widely. Not as widely as those of St. Peter, perhaps, but still portraits and statues of this great church planting apostle are widespread, especially in Europe. 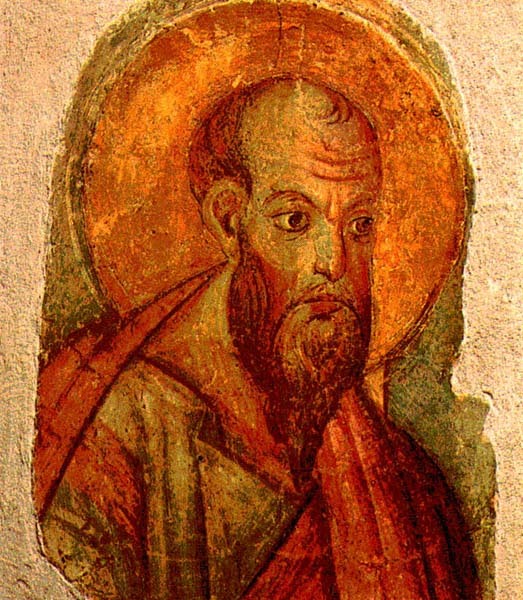 Portraits of the apostle can be identified by a book or scroll, since he was a New Testament writer, and a sword, the instrument of his martyrdom. 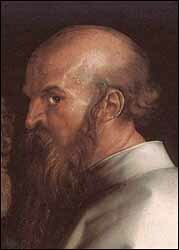 2008-2009 was the Year of St. Paul the Apostle, celebrating his 2000th birthday -- more or less. 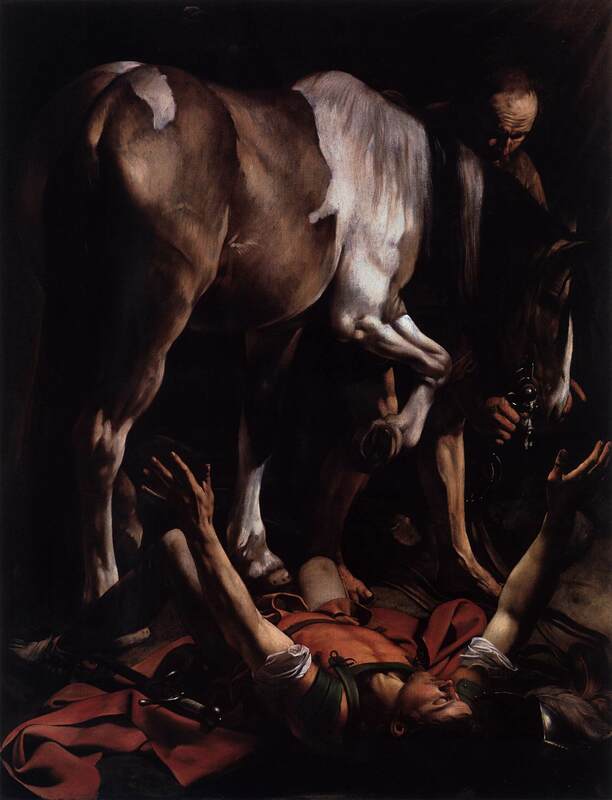 January 25 is the feast of the Conversion of St. Paul. 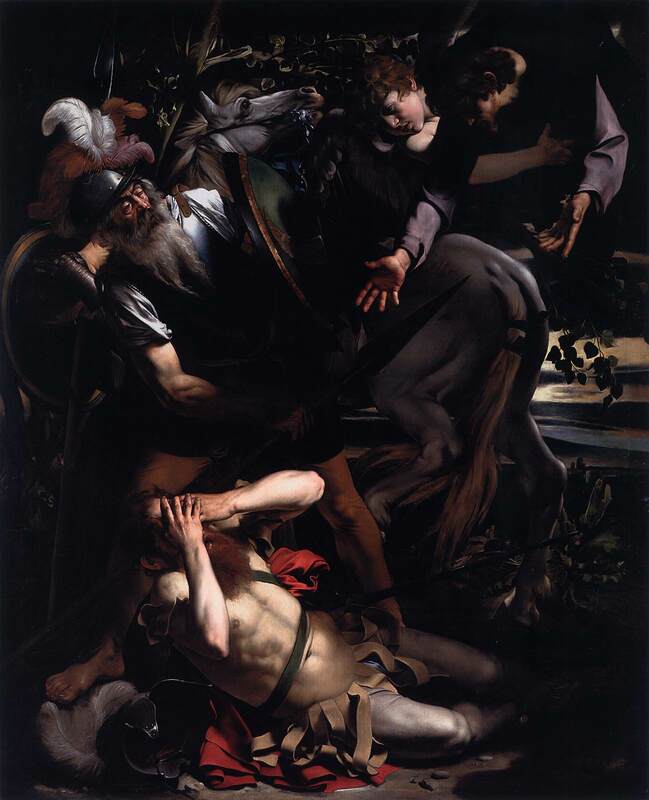 St. Paul in Prison (1627). Oil on wood panel. 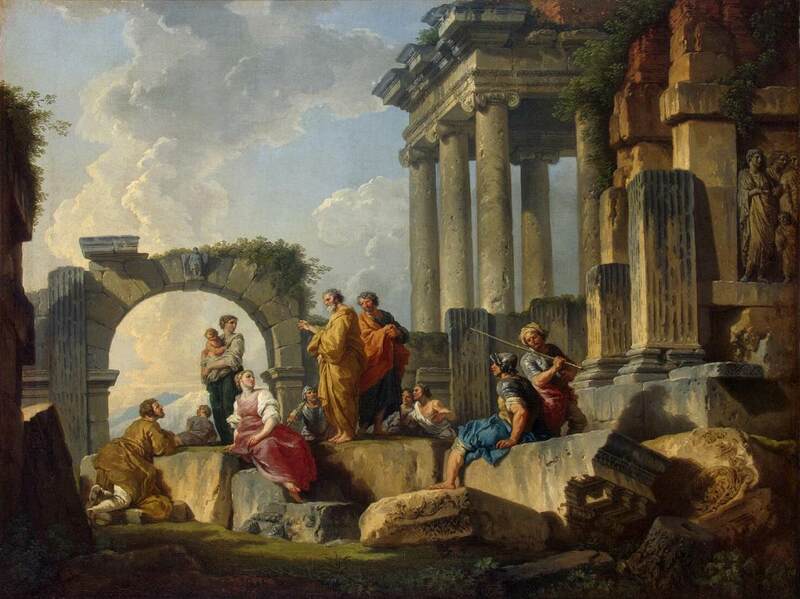 72.8 x 60.2 cm Staatsgalerie, Stuttgart, Germany. Another. 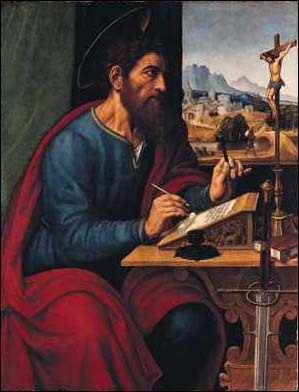 St Paul at his Writing-Desk (1629-30), Oil on wood, 47 x 39 cm, Germanisches Nationalmuseum, Nuremberg. Another. 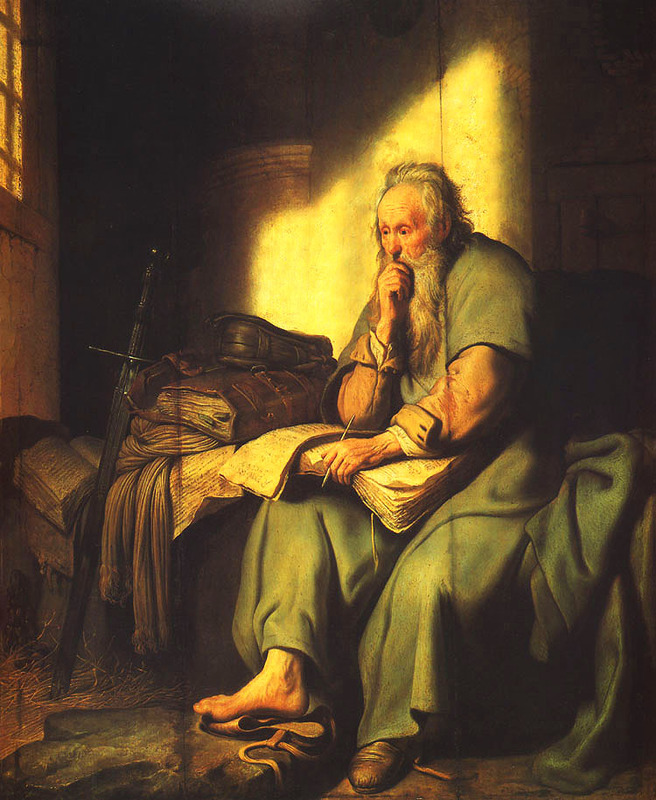 Apostle Paul (1635), Oil on canvas, 135 x 111 cm, Kunsthistorisches Museum, Vienna. Apostle Paul (c. 1657), Oil on canvas, National Gallery of Art, Washington, DC, 40.9" x 51.6" (104.0 cm x 131.0 cm). Rembrandt (and Workshop?). Another. Self Portrait of Rembrandt as the Apostle Paul (1661), oil on canvas, 93.2x79.1 cm, Rijksmuseum, Amsterdam. Another. 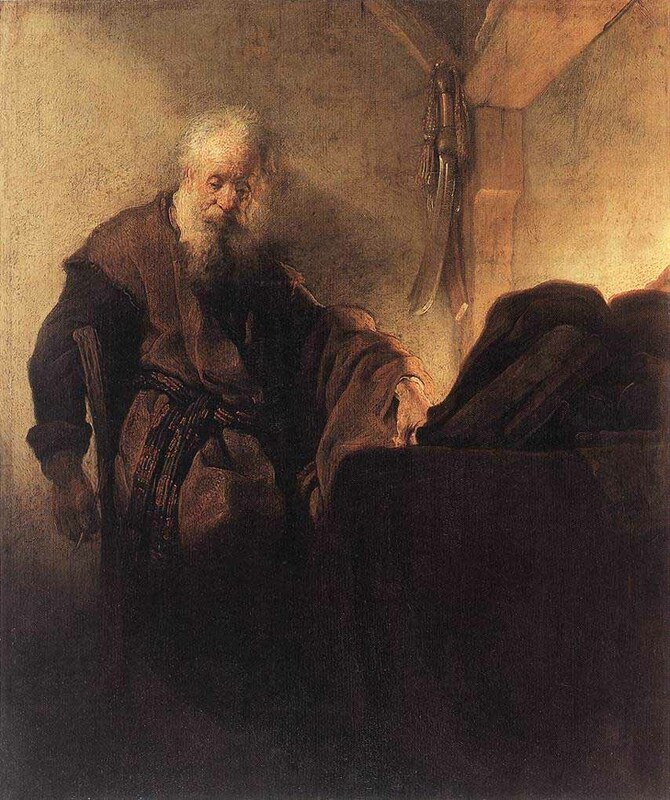 An Elderly Man as the Apostle Paul (1659? ), oil on canvas, 40-3/16 x 33-11/16 in., The National Gallery, London. 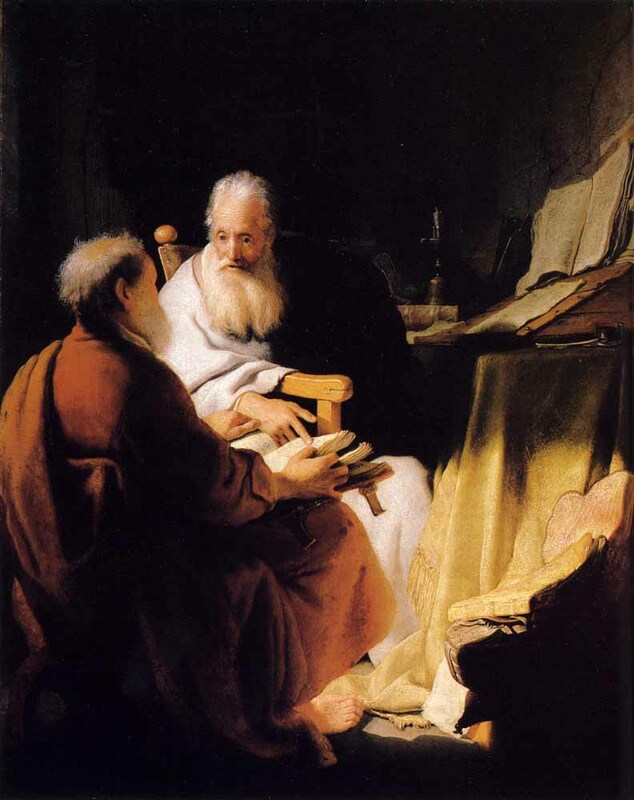 Two Old Men Disputing (St. Peter and St. Paul in Conversation, 1628), oil on wood, 72.4 x 59.7 cm, National Gallery of Victoria, Melbourne, AU. Another. Pieter Brueghel the Elder (Flemish painter (1525-69), Conversion of Paulus (1567), 108 x 156 cm., Wood panel, Kunsthistorishes Museum, Wien (Vienna), Austria. El Greco, "St. Paul" (1606), Oil on canvas, 97 x 77 cm, Museo del Greco, Toledo. Larger image. Antonio da Correggio (c. 1489-1534), The Apostles Peter and Paul, San Giovanni Evangelista, Parma. Raphael, St. Paul Preaching in Athens (1515), Victoria and Albert Museum. Andrei Rublev, Apostle Paul. 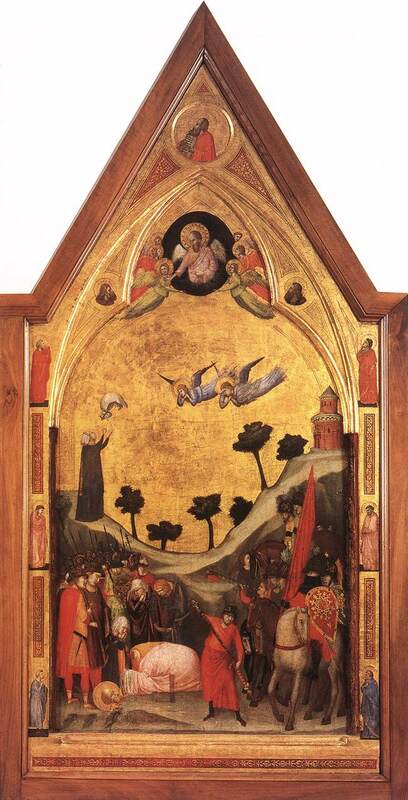 (c. 1420s), tempera on wood. 160 x 109 cm. The Tretyakov Gallery, Moscow, Russia. Albrecht Dürer, detail of St. Paul from "The Four Holy Men (Mark and Paul)" (1526), oil on panel, 215 x 76 cm, Alte Pinakothek, Munich. Full image. 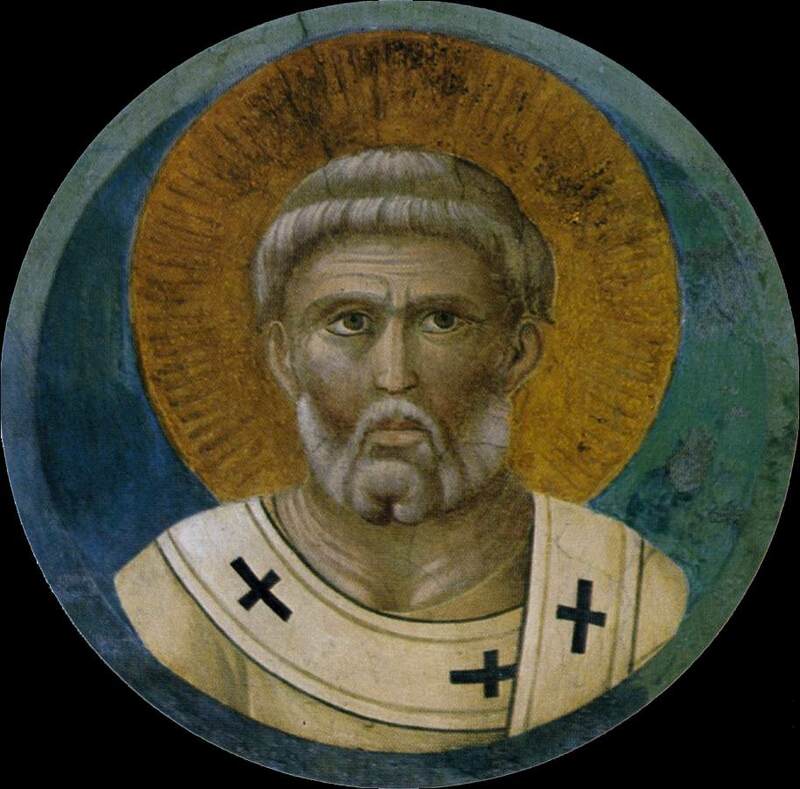 "Saint Paul," Roma, 2nd half of 13th century (fresco fragments; 38 cm x 27 cm), Fabbrica of St. Peter's, Vatican Museum. Larger image. Dürer, Albrecht, The Four Holy Men (Mark and Paul), 1526, Oil on panel, 215 x 76 cm, Alte Pinakothek, Munich. 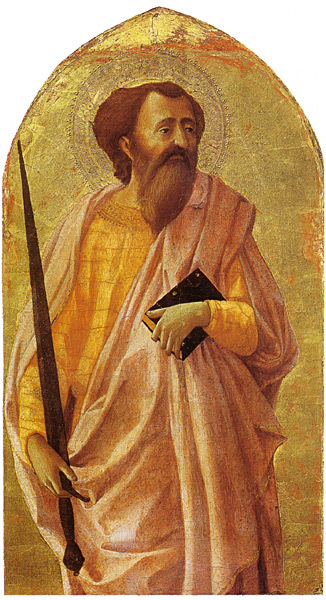 St. Paul is shown in the right panel to the left of St. Mark. Shields, Frederic James (British painter, 1833-1911), St. Paul the Aged, stands over an olive tree and Pan, from the painting in the Chapel of the Ascension, Bayswater Road, London, completed 1910. Chapel was destroyed by enemy action in WWII. Pier Francesco Sacchi (c. 1485-1528), Saint Paul Writing (1520s), oil on poplar, 106 x 81.9 cm. The National Gallery, Trafalgar Square, London. (Probably) Valentin de Boulogne (ca 1594-1632), Saint Paul Writing His Epistles (c. 1618-20), oil on canvas, 39-1/8 x 52-3/8", Blaffer Foundation Collection, Museum of Fine Arts, Houston, TX. Valentin de Boulogne (ca 1594-1632) or Nicolas Tournier (1590-1638), Saint Paul Writing His Epistles (1620), oil. Blaffer Foundation Collection, Houston, TX. Filippo Lippi (Florentine painter, 1457-1504), St. Paul Visits St. Peter in Prison (c. 1480). Paulus bezoekt Petrus in de gevangenis; misschien nog ontworpen door Masaccio. Florence. Pompeo Giralamo Batoni (1708-1787), St. Paul, Basildon Park, The National Trust, UK. Also portraits of St. Matthew, St. John, and St. Peter. Enrique Simonet, The Beheading of St. Paul (1887), Malaga Cathedral, Andalusia, Spain. Pompeo Giralamo Batoni (1708-1787), St. Paul, Basildon Park, The National Trust, UK. Larger image. #49. 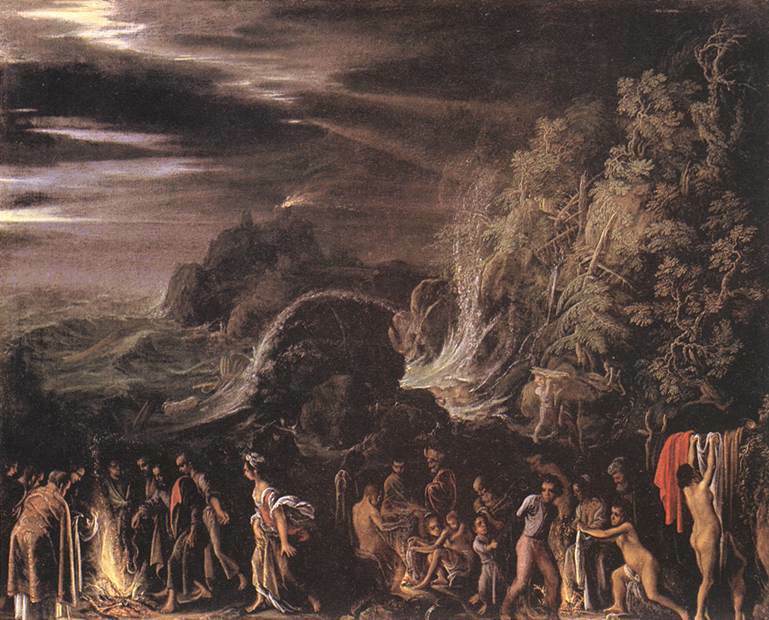 "Paul on the Road to Damascus"
#55. "Paul Being Cured of Blindness"
#56. "Paul in Prison Writing a Letter to Timothy"
#108. 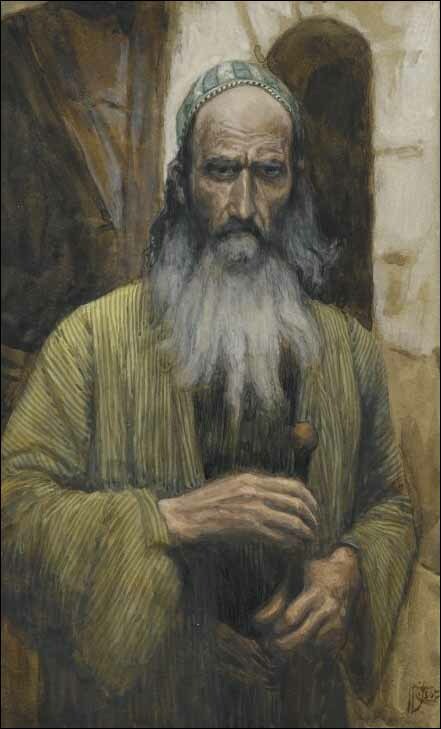 "Paul in Prison recalling stoning Stephen"
James J. Tissot, St. Paul. Circle of Lucas van Leyden, San Pablo (c. 1525), oil on panel, 44 x 21 cm, Museo Thyssen-Bornemisza, Madrid. Philippian Jailer with Paul and Silas, 1900s religious illustration. Initial S: The Conversion of Saint Paul. Attributed to Pisanello, illuminator; Attributed to Master of the Antiphonal Q of San Giorgio Maggiore, illuminator, Italian, probably the Veneto, possibly Verona, about 1440 - 1450, Tempera colors, gold leaf, gold paint, and silver leaf on parchment, 5 9/16 x 3 1/2 in, MS. 41, VERSO. Getty Museum, Los Angeles. Tondo with Saint Paul, Assisi, Upper Basilica. St. Paul, Mural over the door to the Basilica of St. Paul, Rome. Georges de La Tour (1593-1652), St. Paul (1615-20), oil on canvas, Musée Toulouse-Lautrec, Albi, France. Shows Paul with spectacles reading a letter. 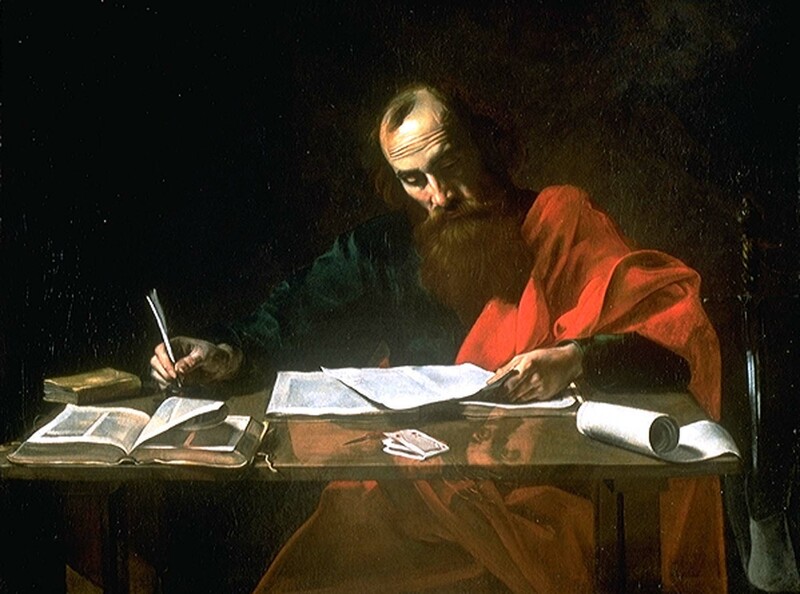 Saint Paul writing. From an early 9th century manuscript version of Saint Paul’s letters, Württembergische Landesbibliothek Stuttgart, HB II 54 The manuscript is ascribed to the Monastery of St. Gallen under the scribe Wolfcoz. Alessandro Algardi (Italian sculptor, 1598-1654), "Beheading of St. Paul" (1650) Marble, height 286 cm., San Paolo Maggiore, Bologna. Larger image. 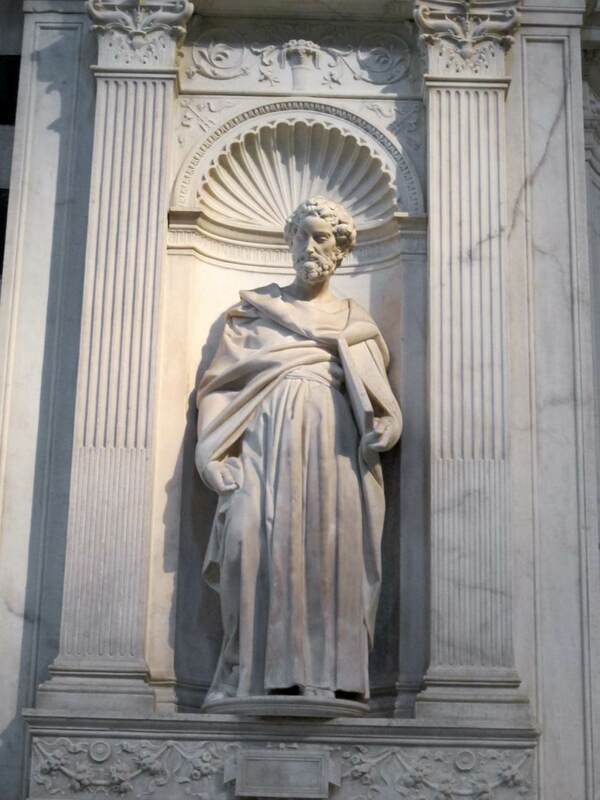 Many cathedrals have statues of the apostles, many of Paul. Here are a few that stand out. Adamo Tadolini (1788-1868), St. Peter (1838), marble statue, in front of St. Peter's Basilica, Vatican, 5.55 m high, pedestal 4.91 m. Restored 1985-86. Antonio del Pollaiuolo, Paul's Decapitation (1484-93), bas relief on Tomb of Pope Sixtus IV (15th century), bronze, St. Peter's Basilica, Vatican. stèle du tombeau du pape Sixte IV, datant du XV°, Paul est représenté lors de sa décapitation, supplice réservé aux seuls citoyens romains. Saints Peter and Paul baptizing their jailers, bas-relief carving in Mamertine Prison (Rome's state prison) above the altar. Medallion of St. Paul, Siena, c. 1320 ( copper with enamel and gilding, diameter 5.9 cm). Bertel Thorvaldsen (1770-1844), St. Paul, statue in Vor Frue Kirke / Church of Our Lady, Copenhagen. Bust of St. Paul, St. Paul's Basilica, Apian Way, Rome. *Statue of St. Paul the Apostle, in courtyard of the Basilica of St. Paul Outside the Walls, Rome. Another. Another. 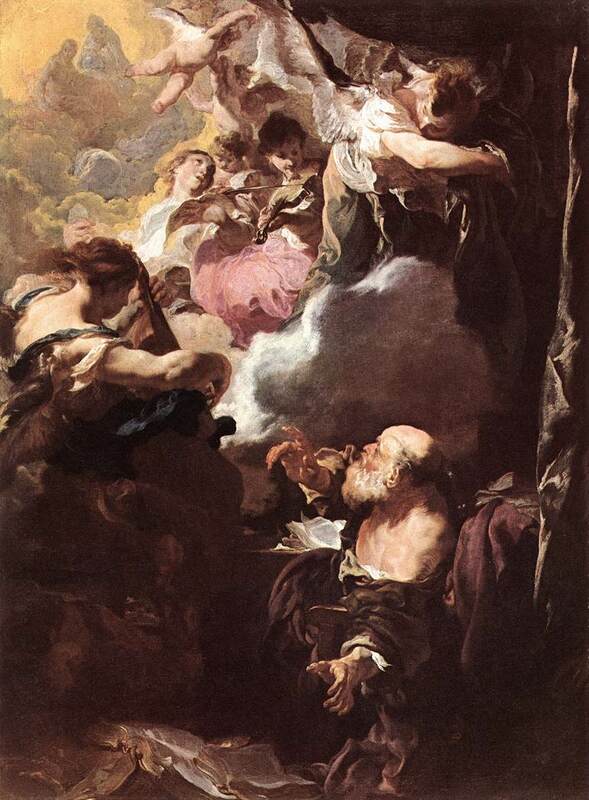 St. Paul the Apostle, shown on left. Location? Statue of St. Paul, central doorway of San Paolo fuori la mura, Rome. 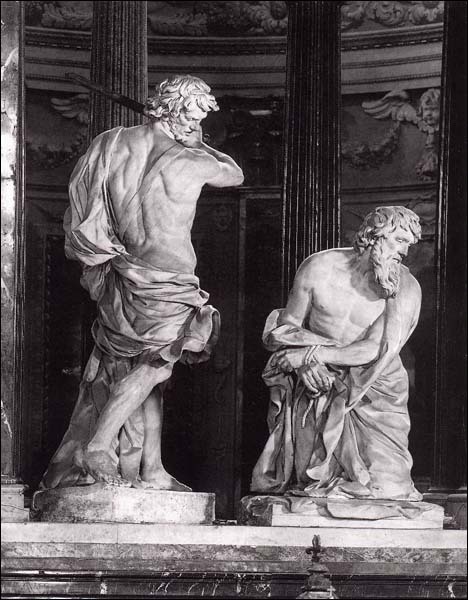 St. Paul and the marble apostles, Rome. St. Paul, Church, Boston, old city. Edgar Bertram Mackennal (Australian sculptor, 1863–1931). New Paul's Cross (1910), bronze, St. Paul's Cathedral churchyard, London. Near the site of the old Paul's Cross, a pulpit destroyed by the Puritans in 1643. The statue is atop a tall column and base designed by Sir Reginald Blomfield (British architect, 1856-1942). Another. Another. Statue of St. Paul, on Ponte Sant'Angelo in front of Castel Sant' Angelo near the Vatican. St. Paul, in front of the Latin School, Nijmegen, Gelderland, Netherlands. The St. Paul Column, Valletta, Malta. Plaster and wood, painted. Saint Paul, (Byzantine, 6th–early 7th century), bas relief on ivory, Musée de Cluny. Adamo Tadolini (1788-1868), "St. Paul" (1838) statue in front of St. Peter’s Basilica, Vatican, Rome, 18.2 ft. high. St. Paul, in front of St. Isaac Cathedral, St. Petersburg. Icon of St. Paul, in Sacred Heart Chapel, St. Paul's Cathedral, London, gilded. St. Paul, in Old St. Paul's Scottish Episcopalian Church, Edinburgh. Russian Orthodox icon of the Apostle Paul (18th century), Iconostasis of Transfiguration church, Kizhi monastery, Karelia, Russia. Saint Paul with his book (rotulus), Arian Baptistry, Ravenna. Saints Peter and Paul flank Christ's throne. 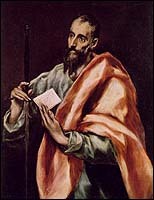 St. Paul is shown with a scroll. St. Paul, Arian Baptistery, Ravenna, come mosaic, baptistery built by Theodoric, end of 5th century. St. Paul is holding a scroll, behind him are martyrs bringing crowns to present. St. Paul, mosaic, church St. Saviour, of the Monastery of Chora, Istanbul Another. Another. Another. 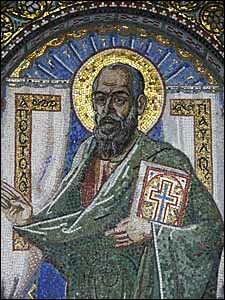 "St. Paul" (c. 799), mosaic fragment, 59.7 x 39.7 x 9 cm, Vatican Museum. Originally decorated the state banquet hall of the papal Lateran Palace, Rome. Restored by Giovanni Battista Calandra in 1625. Eduard Burne-Jones, St. Paul (1881-1898), apse of St Paul's within the Walls (American Episcopal Church), Rome. Sts. Peter and Paul mosaic, apse, Church of St. Prudentiana, Roma. Oldest church mosaic in existence. Mosaic of St. Paul, St. Paul's Church, 2127 W. 22nd Place, Chicago. St. Paul exterior mosaic, caption, "Make Love your aim" standing on a ship, St. Paul's Greek Orthodox Church, Irvine, CA. Chapel of the Basilica of St. Paul Outside-the-Walls, Rome. Saint Paul Window VIII, Paul in Bonds in Prison, Martyrdom, Jesus Receiving Paul, St. Paul's Cathedral, San Diego, CA, from Judson Studios of South Pasadena, CA. Eight St. Paul stained glass windows total of Paul's life. Photos are no longer accessible online. Edward Burne-Jones (1833-1898), "St. Paul" (c. 1874), stained glass, manufactured by William Morris, Ponsonby Church, Cumbria, UK. St. Paul, St. Lawrence's Church, Chicheley. St. Paul, Skipton's parish church. 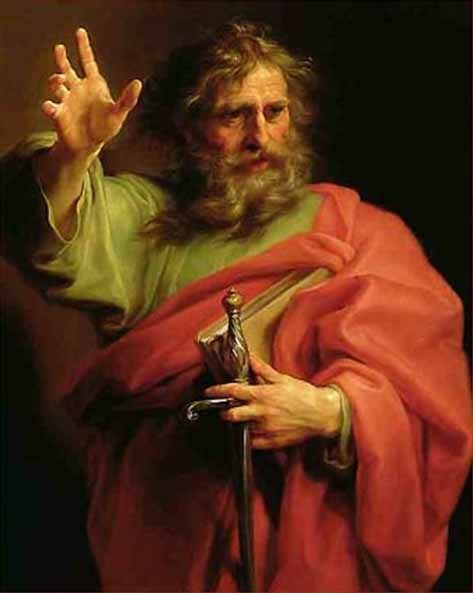 Links to Images of St. Paul, The Text This Week lectionary site.